On May 25, 2018, those who follow internet policy in Europe had one overriding area of interest: the General Data Protection Regulation (GDPR), a game-changing set of privacy rules that served as the perfect cover for another, far more drastic and controversial change in European law. The Copyright in the Digital Single Market Directive had been under negotiation for years, and it was set to be the first update to E.U. copyright since the 2001 Copyright Directive. In the 17 intervening years, the copyright landscape had experienced massive shifts. The new Directive was seen as a must-pass piece of omnibus legislation comprising dozens of wonky and technical fixes to E.U. copyright rules. It was largely seen as uncontroversial — that is, until May 25. Article 13, also known as the “Censorship Machines”: Under this rule, any public communications platform is required to ensure that nothing copyrighted is ever posted without permission, even for a brief moment. The original version of this rule required platforms to adopt copyright filters that would consult a crowdsourced database of copyrighted works and block anything that might match something in the blacklist. (Anyone could put anything into this database, without penalties for false claims.) The current draft mentions filters, but allows platforms to use other approaches — if, that is, they can think of another way to ensure that nothing copyrighted ever shows up on Twitter, Facebook, YouTube, Instagram, Medium, etc. Both of these proposals were and are hugely controversial. The E.U.’s own technical experts had considered and discarded them after earlier efforts along these lines ended in disaster. Germany had tried “Link Taxes,” but Google simply boycotted any site demanding a link license, which gave newspapers no choice but to offer Google free licenses. Google. Google’s smaller competitors, including European sites, did not receive the same offer, meaning that a measure intended to curb Google’s dominance ended up increasing it instead. 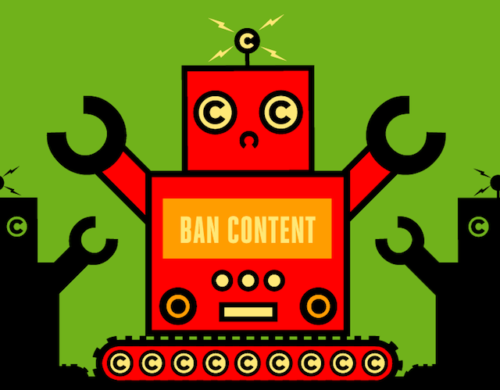 As for Article 13, critics noted significant problems with the voluntary copyright filter Google has already built: YouTube’s “ContentID” system. Content ID is a $60,000,000 copyright enforcement system that allows a few trusted rightsholders to add their copyrighted works to its database and either block any copies of those works, or force ads to appear on any videos the system believes contains their copyrighted works and funnel the ad revenue to these rightsholders’ accounts. ContentID is widely loathed. The rightsholders who use it complain that it doesn’t catch enough infringement. The creators whose videos are flagged by the system say its hair-trigger blocking behavior catches all manner of innocent works, including public domain NASA Mars lander footage, birdsong, background noise, silence, public domain musical compositions, and copyrighted works used in accordance with “Fair Use” and “Fair Dealing.” And YouTube’s army of users complain that ContentID blocks their favorite videos. Rather than fixing it, Article 13 would massively expand this deeply flawed system. Right now, ContentID only filters videos’ soundtracks. Article 13 would expand the filter to consider text, music, video, still photos, software code, game mods, 3D printing files, and anything else that might be copyrighted. ContentID currently allows only a small set of trusted rightsholders to add to its blacklist; Article 13 would let all 2,000,000,000+ internet users add to these blacklists. ContentID reserves the right to cancel a rightsholder’s access to its blacklists for abusing the system — falsely claiming copyright through carelessness or malice, for example — while Article 13 would require perpetual access for rightsholders, even anonymous parties claiming to be rightsholders. Article 13 would give them the power to block anything and everything from being posted to the Internet. These proposals were introduced at the end of May. By late June, more than a million Europeans had mobilized in opposition, forcing a vote in the European Parliament to allow debate before the Directive was passed. Alas, that vote went in Voss’s favor, and Articles 11 and 13 were included in the near-final version of the Directive. This was not so much a victory for Voss as it was a defeat for his opponents, who outnumbered him but who were divided by a series of slightly different proposals amending or striking out Articles 11 and 13. The new Directive is now in the “trilogues” — closed-door negotiations between the E.U.’s Parliament and individual national governments. Normally, these are a formality that takes place out of public view. However, the current trilogue is both more contested and more public than any in the E.U.’s history. The European Court of Justice has ruled that Europeans are entitled to know what happens in these trilogue negotiations, and German Pirate Party MEP Julia Reda has pledged to publish the negotiating documents (and she’s kept her word). What’s more, the trilogues coincide with political changes in Italy, and the Italian government has withdrawn its support for Articles 11 and 13. This brings the proportion of Europeans who oppose these articles past the critical threshold of 35%, a theoretical “blocking minority” that could scuttle the entire proposal (assuming they can avoid the trap the opposition fell into last time: agreeing that these rules aren’t appropriate but disagreeing on what to do about it). It’s not clear what will happen next. If these rules are meant to cut Big Tech down to size, they’re sure to disappoint. Google, Facebook, Twitter, Apple, and the other tech giants are the only companies big enough to be able to afford the hundreds of millions it will cost to follow the new rules. Small competitors in the E.U. just don’t have that kind of cash. Freed from any threat of competition from E.U. companies, dominant tech platforms will be left to grow unchecked. They will present even more of a threat to democratic discourse, privacy, and competition than they already do. And the problems these rules will cause won’t be confined to the E.U. If implemented today, the new rules would force online communications platforms to either block all users in the E.U. or censor the whole world’s internet. Even if you think the internet’s main function is to serve up entertainment and news, these rules are still a bad idea. But the internet is more than that: it’s our new global nervous system. These rules will affect education, civic and political engagement, family life, employment, and a thousand other fields of human endeavor. To pass them would be an act of gross regulatory malpractice in a parliament charged with the orderly governance of more than 508,000,000 people. This article originally published at Medium.com on November 8, 2018.